SS Halcyon under her previous name of SS Sirrah. Note the two masts and large funnel. The ship is in ballast when this photo was taken and you can see how high she rides up in the water by the exposed rudder aft. The Panamanian steam ship Halcyon was built as the Dutch ship Sirrah in 1917 and launched on 31 March. Completed in November, the builders of both the ship and her engines were the Rotterdamsche Droogdok Mij. N. V., Rotterdam Drydock Company, or simply RDM. The ship’s dimensions were 373 feet long, 50 feet wide, and 24.5 feet deep. A single triple-expansion, three-cylinder engine developed 1,600 horsepower (ihp), and propelled the steel hull at 10 knots. The ship was 3,530 gross registered tons (listed in places at 3,531 tons). The yard number was 62, and her call sign was HPKT. Her cargo carrying capacity was 6,293 deadweight tons. The ship’s original owners were the Van Nievelt, Goudriaan and Company’s Stoomvaart Maatschappij. Between 1918 and 1919 the Sirrah was confiscated from the Dutch by the United States government, then presumably returned. 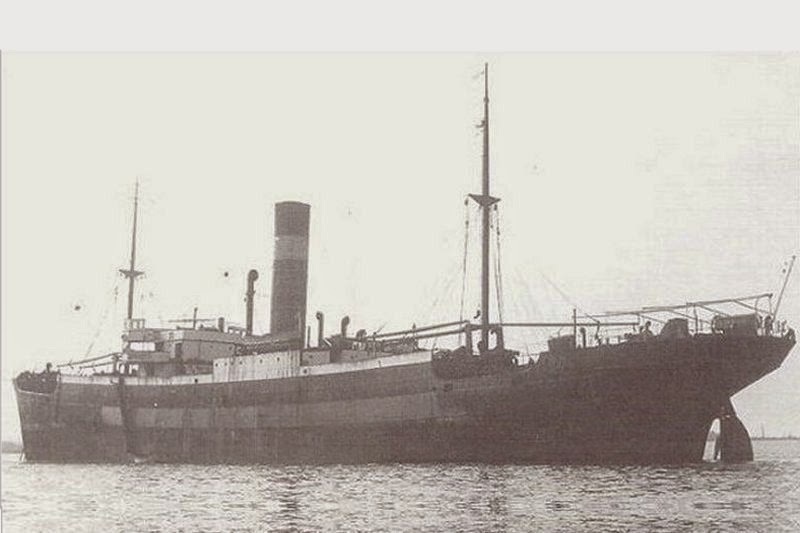 In 1939 the Goulandris Brothers of Piraeus Greece acquired the ship and renamed her Halcyon. They formed the Halcyon Steamship Company of Panama and placed another ship, the Cygnet, in the same firm. On March 11 the Cygnet was attacked and sunk by the Italian submarine Enrico Tazzoli four nautical miles from Dixon’s Hill, San Salvador Bahamas. All 30 Greek officers and crew survived. So perished the only remaining flagship of the firm’s fledgling fleet. On Monday the 2nd of February 1942 the ship proceeded from Halifax Nova Scotia to Georgetown, British Guyana on the northeast coast of South America. For the voyage down the Halcyon carried 1,500 tons of ballast. In Guyana she was to load bauxite, one of the ingredients of aluminum which was widely used by the Allies to manufacture aircraft. There were 30 merchant marine officers and men aboard the Halcyon, led by Captain Peter Petrone. Most, if not all, were Greek nationals. One of the men, named simply Glitsos, was a Third Assistant Engineer and was 70 years of age. As the men anticipated the midnight watch on Thursday the 5th of February the ship had already plodded 650 nautical miles south of Halifax and was only 300 nautical miles east-northeast of Bermuda. In over 15,000 feet of water a torpedo from the German submarine U-109 streaked toward the side of the ship. U-109 was under the command of Korvettenkapitän Heinrich Bleichrodt, aged 32 at the time. At 2:25 pm local time (Eastern Standard plus one hour), Bleichrodt was waiting to transfer fuel from U-130 and his colleague Ernst Kals. What first appeared as a puff of smoke soon materialized into a ship with two masts and a “wide, high funnel,” – a description fitting the Halcyon. Informing Kals, Bleichrodt set off in pursuit. It was to be a long running, one-sided attack lasting over nine hours. Though there was a long swell from the northwest, visibility was very good, and within an hour the ship could be seen from eight miles away, sometimes zig zagging 20 degrees from a base course of 180 degrees south. Bleichrodt over-estimated the Halcyon’s speed at between 10 and 11 knots. The U-boat skipper decided to dive and make an attack at twilight, several hours away. Though dark rain clouds sometimes obscured his quarry, the skipper kept the merchant ship in his periscope sights. A few minutes after 6:00 pm local time, as darkness descended quickly, Bleichrodt waited for the Halcyon to steam into range of his torpedoes and fired from tube one from a distance of 2,000 meters or 6,600 feet, set for a depth of just under ten feet. The torpedo missed. Bleichrodt and his men heard the torpedo continuing its futile run for a further ten minutes. The commander realized that Halcyon was in ballast and thus presenting less of an underwater target, as more of the hull was out of the water, and also that the ship was only making 8-9 knots, not 10-11. At 6:29 pm the sub surfaced 4,000 meters behind the Halcyon and ran alongside the ship about 4,500 meters in order to measure the speed. Both the torpedo and sub remained undetected by the 30 Greek officers and men aboard the ship, as the night was by now dark. 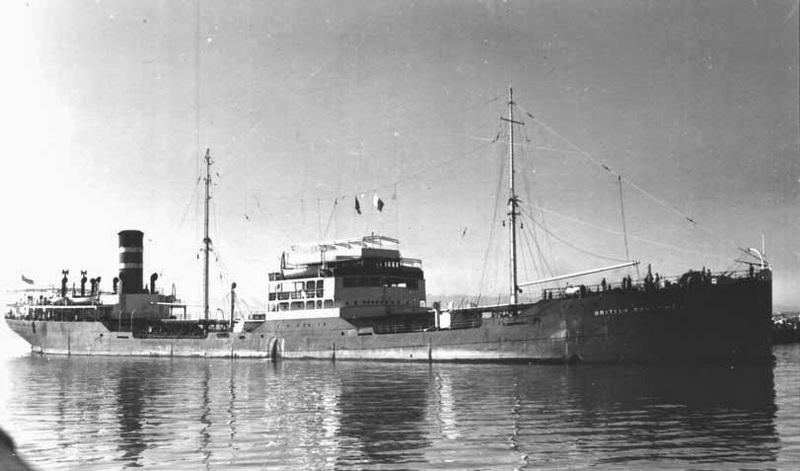 SS Halcyon in her wartime grey, after 1939 but before February 1942 – the launch alongside is thought by one observer to be that serving the anchorage at Gravesend, England. U-109 now looped behind the Halcyon and came up on the steamer’s starboard side, all the while preparing deck guns and ammunition for the imminent attack: the 105 milimeter, 37 mm, and 20 mm guns were ready. At 11:30 pm on the night of Thursday 5th February Bleichrodt gave the order for his men to open fire from 3,500 meters. The first two shots landed on either side of the ship, finally letting the Halcyon men know that they were the unwelcome object of a U-boat attack. The fourth salvo hit Halcyon amidships, beneath the large funnel. The sixth and eight shots hit both the bow and stern. Since they were incendiary shells they set a fire on Halcyon’s stern. Aboard the ship the shock and consternation must have been remarkable. One moment a quiet moonlight night and suddenly from the darkness a torrent of shells set the ship ablaze. Understandably confused, the officers and in particular the Radio Operator was convinced that their ship was under attack by a merchant raider, rather than a submarine which, logically, would have used torpedoes. So instead of an “SSS” message indicating attack by submarine, they sent out an “RRR” broadcast on 600 bandwidth. Indeed the enemy action diary for the Eastern Sea Frontier records that at 22:35 (10:35 EST, or 11:35 pm ship’s time) that “HALCYON had been bombarded by surface raider.” After all, the modus operandi used by U-109 more closely resembled an attack by a surface raider than a submarine. At first the Captain Petrone turned the Halcyon’s stern to the attacker and made for the horizon, but before the ship could even be brought to stop Bleichrodt counted 28 to 30 hits. Bleichrodt pressed home his attack relentlessly, unaware that within ten minutes of the outset Captain Petrone ordered the 30 men into two lifeboats and whatever rafts they could get away. U-109 was however able to read the signal which Halcyon sent, thus identifying the quarry. The confusion over the whereabouts of the men and the lifeboat led to a violent result when one of the submarine’s shells plowed into a lifeboat, damaging it with a three-foot hole that had to be patched with canvas. This shell killed two men in the port lifeboat as it was still alongside the ship, and wounded two others. Captain Petrone was the last man to leave Halcyon, joining eight sailors in the starboard lifeboat. They heard a crewmate crying for help from the water, however shrapnel was passing so close to them that they had to leave him behind. This must have been the third man lost. The men in both boats cleared the blazing ship and watched the U-boat circling Halcyon and delivering fatal shots. U-109 was having difficulty getting accurate fire aboard the ship due to the swell. From distances as close as 1,200 meters and as far as 2,000 meters. There were from five to six hits seen in the engine room, and soon Bleichrodt saw that the “Ship released steam amidships and stopped.” There were vivid flames observed from the stern. U-109 fired 100 rounds before Bleichrodt ordered a cease fire. When the sub approached the ship and found a raft floating with two men on it. The sub avoided the raft but could not see any lifeboats. By now the Halcyon was listing heavily to starboard and was settling by the stern. However despite the many missile strikes the ship was not sinking yet. At 33 minutes after midnight, whilst the 27 men in the lifeboats rowed frantically away, U-109 resumed firing, this time with just the 105 mm and 37 mm guns. As the ship leaned more to starboard the hits along the waterline on the port side rose further out of the water, serving to ventilate air from the hull, but not sink the ship. So Bleichrodt moved to the starboard side, noticing a list of up to 30 degrees, that the bridge was “completely smashed,” and that the cover on the aft hold was also destroyed. Bleichrodt noted that the lifeboats had been launched and that ladders hung from the sides, indicating that the men had gotten away. At 3:35 EST, or 4:35 am ship’s time the Admiralty War Diary logged that United States aircraft were being sent from Bermuda to the site of the sinking. After dawn a Bermuda-based US PBM Mariner flying boat, USN P-12 flying from squadron VP-74 discovered the Halcyon lifeboats as well as two rafts. After circling the scene the plane located the British Prestige nearby and attracted the ship’s attention to the plight of the survivors. That afternoon, Friday the 6th, “Bermuda reported 25 survivors from HALCYON on boats P.M./6 and directed BRITISH PRESTIGE to pick them up.” The British Prestige was built in 1931 at Lithgows Limited of Port Glasgow. She was 7,106 gross registered tons, 440.6 feet long, 59.5 feet wide and 33 feet deep. In February 1942 she was owned by the British Tanker Company Limited of London. Like the Halcyon she was damaged by a mine in 1940 – off the Humber boom on the 13th of November. Her captain when she came to the aid of the Halcyon was E. W. Hills. 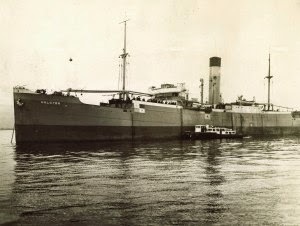 Photo of the British tanker British Prestige during World War II. “However later the aeroplane circled again and told us the course to pick up survivors. He dropped a smoke flare and we could see a Lifeboat ahead. We manoeuvered the ship and took 9 men aboard – the Captain, Mate and seven others. This boat had been shelled at and damaged to the boat had been repaired. Two men were killed and buried at sea. There were three others injured, one with stomach wounds and one with foot wounds. Everybody was running around themselves.” The men who were injured by shrapnel were the Chief Officer, Second Engineer, and a sailor. “Apparently the ship was shelled by a submarine on the surface at 11pm Thursday night. Our Sparks picked up the SOS. And then the submarine shield the lifeboat. Having got these men aboard the aeroplane signaled again and dropped another flare and after an hour we sighted another boat. This was an all-metal boat with 14 men in it.” This boat as in the charge of the Chief Officer. We got these on board and cut the lifeboat adrift. Then thinking we had all we told the aircraft we were on our way but he signaled again and again dropped a flare. This time it was two men on a raft. We managed to get alongside and one man scrambled aboard, the other an old man of 73was not so nimble. He managed to claw a ladder and was holding on with his hands and men were pulling in the ladder with him on it. Another man went on the ladder to hold his wrists but he was gradually slipping away. Another fellow named A. Smith leaned over the side to give a hand but unfortunately the old man let go. Smith immediately went in after him and everybody was running around throwing overboard lifebelts. Smith swam to one and gave it to the old man and swam around him and generally comforted him. The 27 men landed in Halifax on Tuesday the 10th of February where the three injured men were placed in hospital. The survivors were interrogated in order to establish that they were attacked by a submarine and not an armed raider after all. The British Prestige was scrapped on the 29th of February 1956 by T. W. Ward Limited at Briton Ferry in the UK. Fold3.com for US Navy and UK Admiralty reports of the rescue and interrogation of survivors.